In-home elder care providers often provide assistance to senior citizens suffering from a wide range of conditions or ailments. However, arthritis is among the most common conditions causing pain to individuals aged 65 and older in the United States. By being aware of five of the most common arthritis symptoms, professional caregivers can be prepared to offer high quality care tailored around their client’s arthritis symptoms. 1. 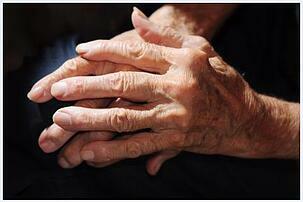 Joint Stiffness: Starting from early in the onset of arthritis, seniors may suffer from joint stiffness. Most prominent after long periods of rest or inactivity, this arthritis symptom can be managed with simple stretching before naps and bedtime, or encouraging clients to get up stretch or go for short walks during long periods of sitting. Reminders for activities to ease joint stiffness can be easily included as tasks for caregivers via a home care software or home care system, like ClearCare. 2. Joint Pain: While stiff joints are a nuisance, joint pain can be excruciating if left unmanaged. When homecare clients with arthritis symptoms complain of pain while completing activities of daily living, assign tasks in your agency’s home care software or home care system to help ease the pain. For instance, assisting with getting dressed or preparing meals may reduce joint pain in the hands, while help with laundry and household cleaning may help wrist or leg pain. 3. Limited motion: Pain, swelling and stiffness may lead to a limited range of motion in seniors with Arthritis symptoms, thus making it difficult for seniors living at home to reach items on high or low shelves. Note limited range of motion in the assessment portion of your home care system or home care software. Remind caregivers to leave important items, such as medication or pre-made meals in the fridge in locations that are easy for the client to reach. 4. Tenderness: Arthritis flare-ups may cause tenderness around the affected joints. Utilize a powerful home care system or home care software, such as ClearCare, to track joint tenderness. This information can be used to keep family caregivers or other members of a senior’s care team up-to-date on the progression of arthritis symptoms via a secure log-in provided by home care software like ClearCare. 5. Redness and warmth: One common arthritis symptom that is outwardly recognizable is redness and warmth of the skin around the affected joints. If caregivers notice skin irritation and clients with Arthritis complain of pain, advise caregivers to make a note in your home care system for family caregivers and other senior care providers to review. Caregivers who are aware of common arthritis symptoms will be capable of providing service that provides relief for seniors living as independently as possible with arthritis.